Pylon signs are also commonly called pole signs. If your goal is to maximize the street-level impact of your logo, then a pylon sign is often the best solution. This sign type will maximize brightness and viewing distance for your logo, which will generate long lasting impressions for your organization. Each city has different rules governing the size and setback distance for pylon signs, so it’s important to be familiar with that information before we start work. If you don’t want to do that homework, please give us a call! 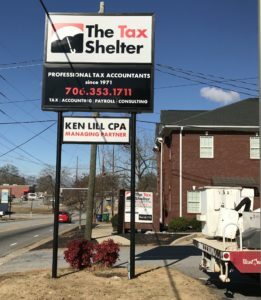 We’re very comfortable navigating local sign ordinances with multiple cities and counties across the state of Georgia. We can do the research necessary to make sure that your sign is code-compliant. When the time comes to produce and install your sign, our team is ready. We can safely help with the entire procedure, from digging the footers to setting the poles; and from the concrete pouring to the lighting connections that will complete your project. Your pylon sign is in good hands with us.